Some notes about the foresight methodologies discussed at the LIFT07 workshop "Re-designing the city of the future" that I co-organized with Bill Cockayne last week. The purpose of the workshop was to a gather an heterogeneous crowd of people to discuss topics regarding the city of the future. The point in preparing this workshop was also to deal with new methodologies, to better structure foresight ideas (for instance to go beyond the design scenarios developed in the past series of blogject workshops). This is why I teamed up with Bill who gave an insightful presentation of critical foresight tools that I describe hereafter. As opposed to design (i.e. build/invent/create), foresight is about critically explore assumptions, build models & develop questions about the long term future. One of the pre-requisite of the workshop was to read various papers that exemplified different visions of the future: Fast, Huge and Out of Control, Metropolis (1999), 'Future Cities', Time, 1929 and 'January 3000 A.D.', Harper's New Weekly Bazaar, 1856. The reading of those papers was meant to spark some discussion about critical foresight: Did any of the authors did each guess correctly? If no, why were some guesses so bad? What were the changes? Were these changes social or technical? Was it a driver or a reaction? Global or local? 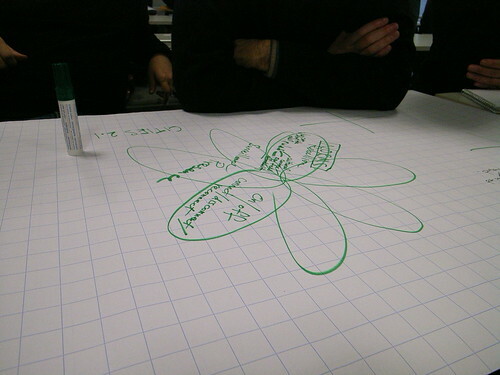 Then Bill introduced the first "tool" in the form of a petal graph. This is basically a diagram where he mapped each critical aspect of change that the group listed. The goals is then to find the commonalities of all these aspect, what goes in the center of the flower. The petal graph is indeed a good tool to realize how the future is a complex problem. One one hand, it's uncertain (not measurable). On the other hand, it's ambiguous and we do not even know what to measure. However, this does not mean that we cannot make assumptions: "You can't predict the future, but you can invent it" as the motto says. The point here is not too do futurism but to look at data and use analytical reasoning to discern what might exist and what we could build. Thus, the value do not lay in predictions but in the underlying discussions: the "why" of predictions: we thus focus on the questions generated, not the answers. This said, the crux issue in foresight is to be critical about what others says about "the future". This is why we looked at different material, be it press article, journal papers or the Walt Disney's EPCOT center video. In a sense, the main goal is to explore, deconstruct, and critique the futures envisioned by others as a methodology of understanding, using a multidisciplinary approach. The following step was to use three tools for foresight thinkings: S-curves, x/y axes and white/hot spots. The s-shaped curve is the canonical representation of how an invention evolves over time from the idea to the mass-market commercialization (plateau) with every technologies/instance that occurred in between (and caused the raised of the curve). This tool enables the discussion about the social/technical changes that allowed this progression. Lots of questions can be asked using this curve: Why do so few futures seem to follow the path? This helps contextualizing what's going next. Then we picked up 2 dimensions/topics that can interact and represented them on cartesian axes. The choice of these axes is important since it is meant to generate "questions". Once the axes are defined, this is a tool to discuss stories/concepts/inventions and position them in the quadrants according to the 4 dimensions that has been set. This allows to have white spots that can be considered as opportunities (or they don't exist for a certain reason that should be discussed) and hot spots with a high density of existing examples. Based on white/hot spots and depending on the time range, one can then unfold the history backward as represented on that picture to answer the question: how did we get to this spot, when were the changes? Doing so need to think about early indicators of change, whether those changes are already in view, what type of events? where would this events be likely to occur. Once this was done, Bill introduced tools for "Foresight Thinking for Designing": observe, analyze and prototype. Observing is a matter of thinking about people today and at future time: assuming that people will change, what would be the reasons/motivation/driver, when thinking about change what are the early indicators (triggers or incipient)?. The analysis part is mostly about questions: ideas are fine but questions are more important and assumptions critical. Finally, the prototyping part concerns the models but also the underlying assumptions, questions, and changes. The best models generate questions around the areas of highest change. And finally the last step is to communicate, which can take various forms: stories (short stories, speculative fiction, science fiction, counterfactuals), scenarios/personas, movies, maps (Cross-impact, Trends, S-curves) or even tangible artifacts. We then constituted 5 groups who had to use the previous tools to had to develop a future to report about the "city of the future" and tell this to the others at the end of the workshop. If I have time I'll post about the workshop results but to me the most important thing was the discussion it fostered (especially among groups).